“Mr. 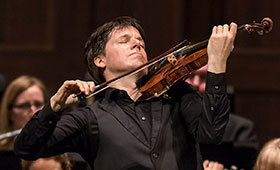 Bell,” writes a New York Times critic, “doesn’t stand in anyone’s shadow.” The Mr. Bell in question is Joshua Bell, one of the most acclaimed violinists of our time. Bell makes his first Penn State appearance in more than seven years when he performs in recital with British pianist Sam Haywood. The concert is scheduled to include Johannes Brahms’ Violin Sonata No. 2 in A Major, Edvard Grieg’s Violin Sonata No. 2 in G Major, Sergei Prokofiev’s Violin Sonata No. 2 in D Major, and additional works announced from the stage. An exclusive Sony Classical artist, the American violinist has recorded more than forty albums in his career as a soloist, a chamber musician, and a conductor. He has earned Grammy, Mercury, Gramophone, and Echo Klassik awards and is the recipient of the Avery Fisher Prize. Since 2011, Bell has been the music director of the Academy of St. Martin in the Fields. He is the only person to hold that post since Sir Neville Marriner created the British orchestra in 1958. Haywood, originally from England’s Lake District, performs an array of piano repertoire as a soloist, a chamber musician, and a lieder accompanist. He has had a regular duo partnership with Bell since 2010. He also often performs with cellist Isserlis. “With a lyrical sensitivity honed by his chamber-music performances, pianist Sam Haywood creates melodies scaled to perfection against a patina of swirling accompaniment,” observes a Washington Post reviewer. The pianist has recorded two solo albums for Hyperion, one featuring piano music by Julius Isserlis (grandfather of Steven Isserlis) and another of Charles Villiers Stanford’s preludes. In 2013, he co-founded the Solent Music Festival. The Lymington-based festival has become an annual event. Watch Joshua Bell perform Bach on PBS NewsHour.